Keep Track Of Wi-Fi, Near And Far, And Manage It. Analyzing data packets is one way to monitor for problems in your network traffic or to detect connection problems. Wireshark is a professional protocol analyzer aimed to help users in troubleshooting, analysis, software and protocol development, and education. All of the standard features you expect to find in a protocol analyzer are here but Wireshark also has a few added extras because it's open source and has been enhanced by it's community of users. The contribution of global networking consultants across the globe are what make Wireshark a particularly powerful analyzer. 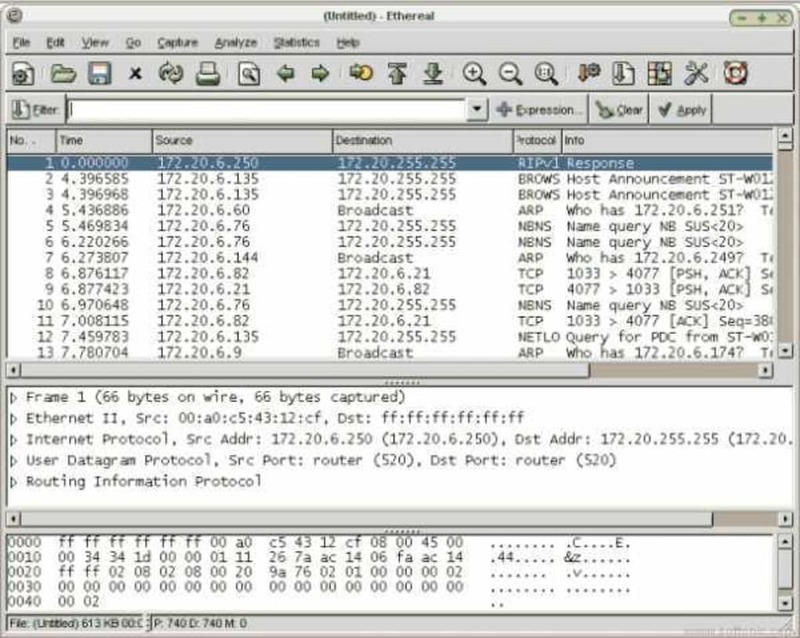 If you don't have any network analyzing knowledge, Wireshark might make you feel a bit lost. The program does have an extensive manual and forum but unless you are familiar with protocol analysis, they won't mean much to you. For those that are in the know, Wireshark features deep inspection of hundreds of protocols, live capture and offline analysis and even VoIP analysis. Any captured network data can be browsed via an easy to use GUI or alternatively via the TTY-mode TShark utility. In addition, live data can be read from Ethernet, IEEE 802.11, PPP/HDLC, ATM, Bluetooth, USB, Token Ring, Frame Relay, FDDI, and others (depending on your platform). Wireshark is a highly specialized tool that the average user won't find much use for but for any network administrators out there, it's an essential addition to your toolkit. Best used to monitor a network...... .....and NOT your girlfriend! Recently in the news for assisting some bloke to catch his woman cheating, Ethereal is a handy packet sniffer that will capture and decode everything that is going through a network. Why you would want to see what your lady friend is chatting about is totally up to you, but with this tool you can do it pretty easily. Takes a bit of time to get used to, especially if your on a busy connection. Make good use of the filters and you'll be able to check practically any element of the network traffic whether over a wired connection or a wireless. Records all your network traffic, Lets you see what it's being used for, chat conversations, web pages, passwords, etc. What do you think about Wireshark? Do you recommend it? Why?